Is your business, organization, or group interested in getting involved with us? There are many ways! Working as a group is a rewarding way to strengthen teamwork while working alongside us toward our mission. Groups large and small volunteer together at the food bank, sorting food in our warehouse, assisting clients during food distributions, or helping out with special projects. If weekdays are a challenge, consider a group volunteer opportunity with us on any 2nd Saturday, 10:00a.m. 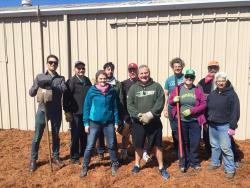 to 1:00p.m., when we sort food donations, pack senior bags, spruce up the landscaping, and tackle similar projects that set us up for the rest of the month. Consider becoming one of our Full Plate Partners as a business, by making a recurring monthly donation online or by mail. Host a food drive, whether occasional or ongoing. Many groups collect food year-round, while others focus on specific times of year. Some keep it fresh with rotating themes, like "protein month" or "peanut butter week". Our food drive page provides lots of tips, ideas, and resources for making sure you collect items from our most-needed foods list. Become a Hunger Fighter team during our holiday food drive. The Hunger Fighter Challenge is a friendly competition amongst local businesses, organizations, agencies, and groups, to see which Hunger Fighter Team can collect the most money and food for the food bank from the beginning of November through the end of December. We can provide an array of resources to help you be a successful Hunger Fighter team. Learn more about the nuances and challenges of living with hunger by having us lead your group through our unique Hunger 101 learning experience, in which participants are asked to “take on” the life circumstances of someone in Humboldt County who may be hungry. The focus of this exercise is to help participants understand the complex economic and social circumstances that lead to and perpetuate hunger. This is a compassion and empathy-building activity that helps participants understand how poverty creates tough choices for people in need. Some groups like to do this activity in conjunction with volunteer service or food drive activities, to learn more about our community, though we are happy to provide it on its own as well.